Map and location of Bareilly Compound. A leather shop in the main lane. A workshop with young workers from Bihar and their manager. 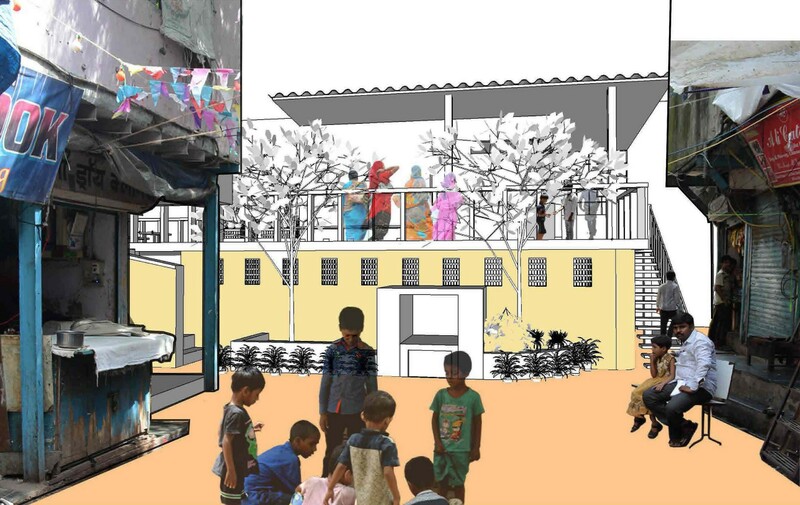 Four years ago the urbz team documented a few “tool-houses” in Dharavi. One of them was the house of Waqar Khan’s family which included a garment workshop and a showroom. Mr. Khan, a businessman, community leader and social activist was born in Bareilly, Uttar Pradesh. His life is a Dharavi success story like few others. He arrived in Mumbai with nothing and thanks to his hard work, business acumen and social skills, built a solid business with a distribution network stretching all the way to Goa where he opened a shop several years ago.. A good share of his earning was reinvested in the community in the form of short term loans to fellow migrant entrepreneurs, helping many start their own businesses at a time when banks and formal lenders were red-lining Dharavi altogether. Waqar rose to prominence as a community leader shortly after the Bombay Riots of 1991-92. 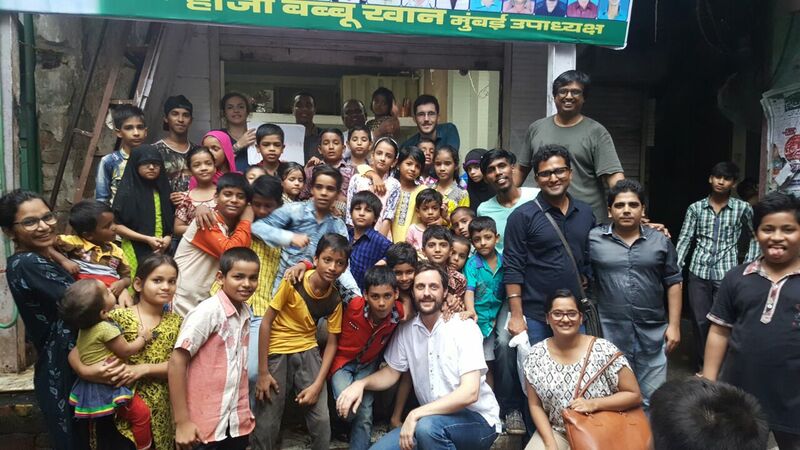 Along with community activist, life-long Dharavi resident and urbz mentor Bhau Korde, he initiated a “communal harmony” movement, which aimed at healing the relationship between Hindus and Muslims, who had been living side by side as partners, neighbours, and friends ever since Dharavi welcomed its first Muslim migrants over a century ago. The riots had little to do with Dharavi and much to do with divide-and-rule strategies by unscrupulous politicians. They didn’t start in Dharavi, but were sparked by radicalized elements from other parts of the city. Nonetheless, they put the settlement, which was already struggling with poor infrastructure and prejudiced policies, into fire. The post-riot tension was particularly unbearable in the hyperdense context of Dharavi, where the codependency between communities was extremely strong. With time, owing to the communal harmony movement and the goodwill of Dharavi residents, the tension finally eased, and life and business resumed. When Waqar Khan passed away, in 2010, people from all communities and religions attended his funeral and praised his contribution in making Dharavi a better place. The street where Waqar lived and worked is located in Social Nagar, off Dharavi’s 90 feet road. A casual passerby would not really notice it. At first sight, it is just another busy, narrow lane. But in Dharavi, every street has a unique story to tell. These stories reveal as much about the personal journeys of the people who inhabit the street, as about the larger and rapidly evolving context of urban India. Two months ago, three young architects from the urbz team -Samidha Patil, Perrine Cariou and Alex Lambert- went back to that street to see how it had evolved. A couple of decades ago, the street was almost entirely inhabited by families from the city of Bareilly in Uttar Pradesh, like the Khan’s. This is how the area got to be known as Bareilly compound. Most of the workshops in the area were in the garment business. But when the competition in this sector became too fierce, many of the workshops turned to leather manufacturing. 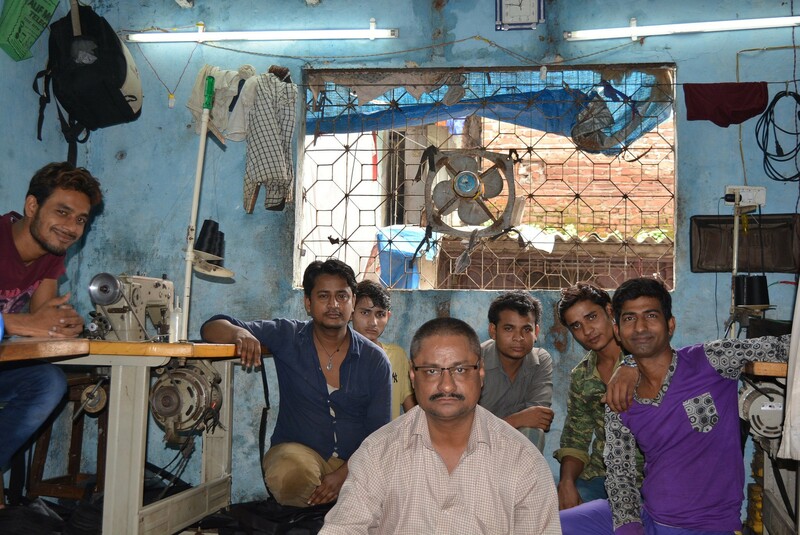 Some of the families in Bareilly compound have been there for about four generations, but the street is now largely dominated by workshops, with a proliferation of retail activities at the ground level. 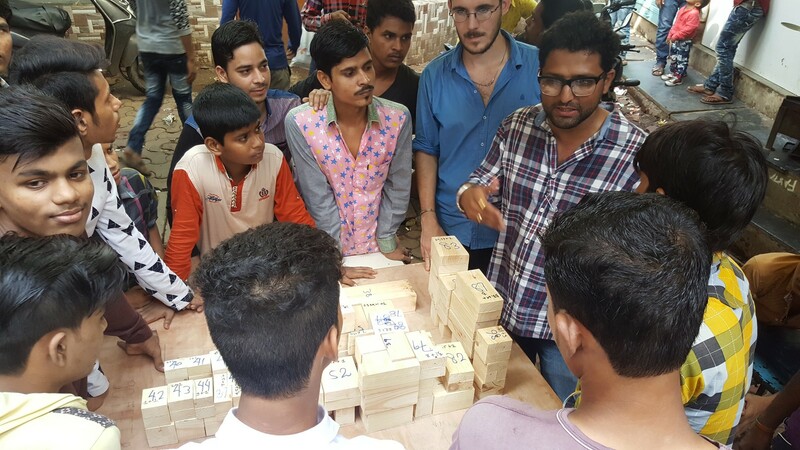 The workshops almost always double up as dormitories, where seasonal workers sleep while they are in Mumbai. The main lane is rather narrow, but constantly busy with people passing through or stopping to make some purchase at one of the 8 leather shops out of 22 shops lined in the street. This street opens to a square around which there are 5 residences, 33 workshops and a public toilet. Around 245 people live and work in Bareilly Compound. They are predominantly Muslim, but not only from Bareilly. Several come from Bihar and other parts of India. Waqar’s son Gulzar Khan, runs the family business now. He says that many things have changed since the passing of his father. For one, the business has transformed a lot. His family still deals in garments, but they are no longer involved in manufacturing. He says that a tightening of governmental control has made life harder for big and small entrepreneurs in Dharavi. For instance, it is no longer possible for a workshop owner to borrow money locally to buy the raw material he needs to fulfil an order. Renting space for a shop is also more expensive. As a result, a lot of the production has gone out of Dharavi to places which are cheaper and less restricted. Whatsapp is Gulzar’s tool of predilection. 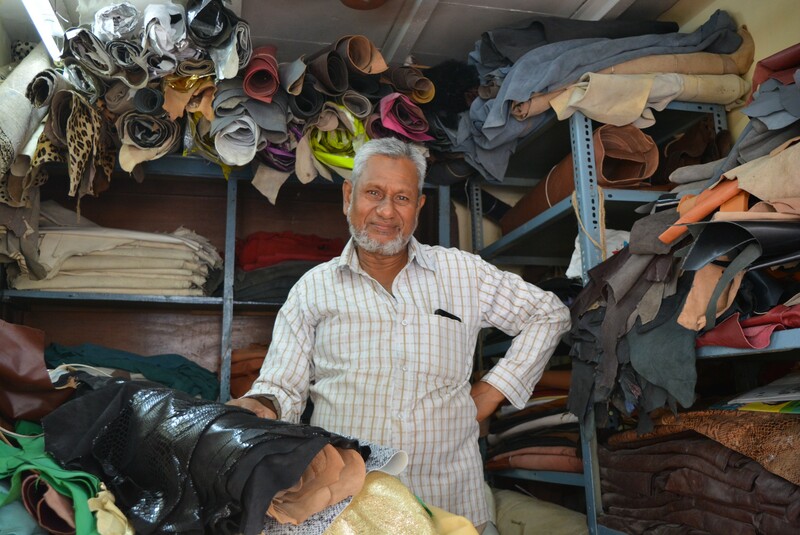 His orders are manufactured in the periphery of Delhi (where space is much cheaper) or back in Bareilly where hundreds of workshops, often financed by Dharavi entrepreneurs, have opened up. This shift in the market has affected the community and forced some of them to move out of the street. Today, the numbers of both, the community and the garment market, has reduced so much that there are few traces of its once bustling presence. This change is reflected in the appearance of the street. During the heyday of the garment market, there were many more families living in the street. Most of them involved in the production or wholesaling of garments. There are only a few families left in the street now. Their spaces have been replaced by workshops, which have multiplied in the street. People still live in the street, but most of the residents are single men, who have less of an investment in the improvement of the general conditions. Quite a few families have kept businesses in the street by moved out to find better living conditions elsewhere. The government has been neglecting infrastructure for years now and even the most invested families, such as the Khan’s feel disillusioned about possible improvement. Many efforts by inhabitants have been made, but without official support, things such as drainage or public toilets cannot be fixed. A single toilet block with 14 cubicles each for men and women caters to 245 residents from the compound, and hundreds others from close-by areas. This toilet block is described by women and young children as ‘dark and scary’. The worst part is that it doesn’t have running water. So people have to go to the toilet with buckets. This really baffles us, because connecting a toilet block to the water system is no rocket science. People have managed to get running water for their own homes. The municipality have managed to provide a source of running water in the compound for domestic use which is few steps away from this toilet block. How come they don’t manage to bring running water to the toilets? The only plausible answer is that the authorities prefer to keep it that way, so people never get too comfortable and readily agree to the redevelopment plan that has been on the cards for decades. Total neglect and laxity by the municipal authorities was again clear in the narrow lanes around the square with their uneven paving and open gutters. This seemed particularly unfair to the children who had to jump over a hole on the ground to get in and out of their houses. Proposition for a recreation ground for young children and their mothers on top of the toilet. Jai Bhadgaonkar presenting a wood model of the area to residents. 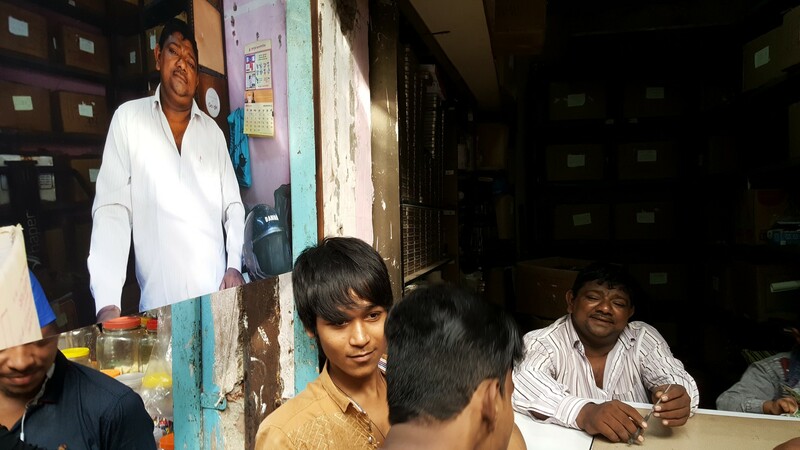 A shop owner posing by a photo of him exhibited in during the street exhibition we organized. 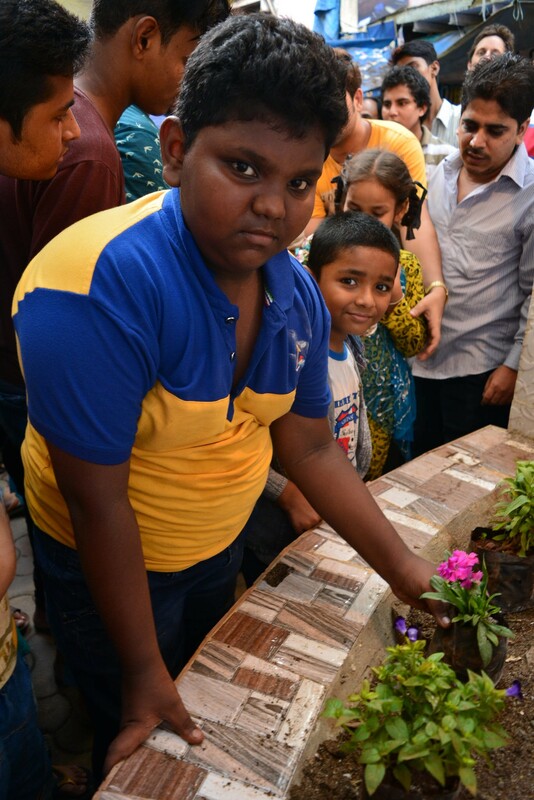 Kids planting flowers as a symbolic gesturing expressing their desire for the improvement of the space where they meet and play. Far left, Gulzar Khan, Waqar’s son. The urbz team with lots of kids from the area. 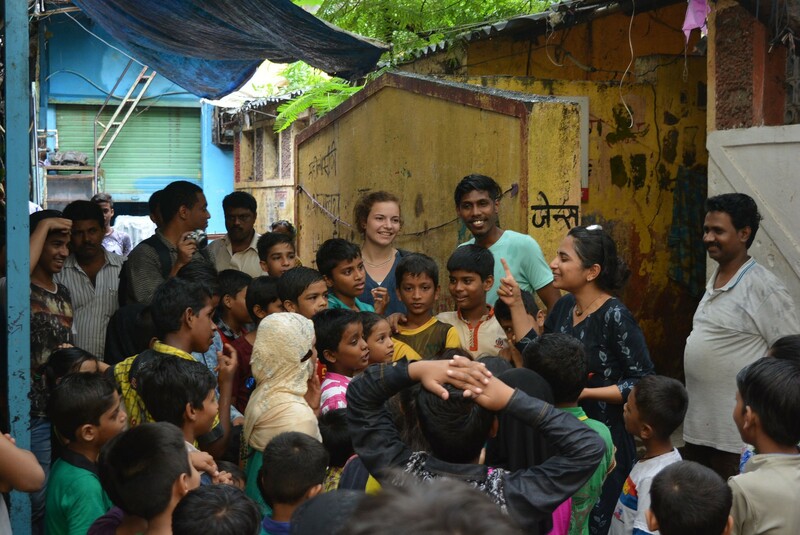 Perrine Cariou, Larson A. Vaiti and Samidha Patil organizing a treasure hunt with the kids at Bareilly Compound. 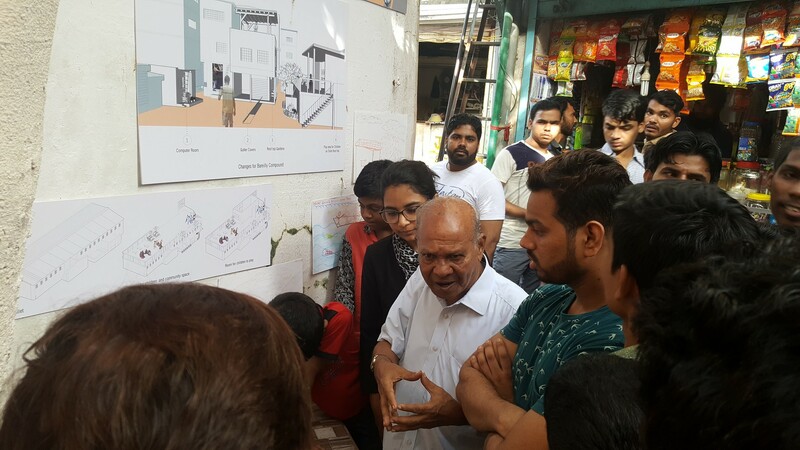 Life-long Dharavi resident and activist, Bhau Korde explaining some of the ideas developed by the urbz team to residents of Bareilly Compound. In order to understand the neighbourhood from the children’s perspective, we organized a treasure hunt in the compound, painting workshops, micro-gardening and other activities. Over forty enthusiastic kids joined the fun. Many ideas for simple interventions came out of these interactions with the kids. The toilets were a big concern for them. The common square was a place they particularly liked, as kids from the surrounding areas gathered there to meet and play. We also talked to many young men in the street and as many women as we could in their home. Many of them expressed a very clear interest for improving the compound. At the same time a fatalistic feeling prevailed. Very few people have the energy of Wakar Khan when it comes to mobilizing neighbourhoods, advocating for change and getting involved. These local leaders are precious and often taken for granted. We worked on a series of small projects like redesigning the toilet block to make its roof usable for small children and their mothers. We also proposed a child day-care center run by local women operating from some of the vacant units in the compound. Another suggestion was a system to close the gutters for safety, while making it easy to reopen them whenever they needed to be cleaned up. After nearly 10 weeks of study and involvement in Bareilly Compound, we organized a street exhibition that aimed at sharing our analysis and ideas for the street. Shop owner’s pictures were printed and hung outside their shops much to their delight. A wooden block model of the compound was the center of attraction with each resident coming in to identify their own house and shop. The interventions proposed were presented at a community meeting, organised in part by Gulzar Khan, where the residents voiced their opinions about the project. Those who were initially skeptical about our loitering in their compound were quite happy with the work we presented to them as they understood the purpose of the 2 month study. What comes next is yet to be done. Our involvement needs to be met by that of residents, and ideally by the municipal authorities. We are now seeking financial support and authorization to fix the toilets and create a space for children and their mothers. We feel that rather than a big bang approach to social and urban change, an incremental, participatory approach has a better chance of being sustained. What this kind of approach needs more than anything is validation by peers and officials. The residents, for their part, have so far only relied on their own initiative to improve their habitats. It is time to take them seriously and help them move on to the next stage of incremental development and improvement.